Fig. 1. SPN activity in patients and nonhuman primates. (A) Examples of spike trains and SPN waveform from each patient with PD. (B–D, Left) Images with fusion of preoperative T2-weighted MRI with electrode trajectory to the DBS target passing through delineated striatum (blue), globus pallidus externus (GPe) or thalamus (green), and GPi or STN (red). (Right) Analyzed SPN activity (from Top to Bottom): raster, trace of the spike train, waveform, firing frequency, and ISI distribution over time. Blue and red colors in C show two isolated SPNs in a multiunit recording. The Far Right graphs show principal component analysis in each example. (E) Scatterplots of SPN firing frequencies in the caudate nucleus and putamen of patients with PD and in caudate–putamen of patients with ID and ET. (F, Left) Image showing a coronal section of the NHP brain with a scar of the electrode track extended by a dashed blue line according to the used angle. The image corresponds to the matching postcommissural coronal plane in the monkey atlas (A11, posterolateral putamen). (Right) Analyzed SPN activity in parkinsonian (MPTP treated) and normal NHPs displaying the same analyses as the human recordings. *P < 0.01 (unpaired t test). Cd, caudate; Put, putamen. Credit: Singh A, Mewes K, Gross RE, DeLong MR, Obesod JA, Papa SM (2016) Human striatal recordings reveal abnormal discharge of projection neurons in Parkinson’s disease. Proc Natl Acad Sci USA 113:34 9629-9634. (Medical Xpress)—Parkinson's disease (PD) – an incurable, progressive illness caused by dysfunction and death of dopaminergic neurons in the brain (mainly in the substantia nigra) – results in a wide range of symptoms, motor system disorders such as tremors, akinesia (muscle rigidity), bradykinesia (slowed motion), and impaired balance (PD-related nonmotor symptoms include depression, gastrointestinal disorders, low blood pressure, and sleep disorders.) While PD can be managed with to varying degrees with medication and (less frequently) surgery, its precise cause has yet to be identified. At the same time, neuronal interconnection (or circuitry) models of Parkinson's disease are based on dopamine loss in a subcortical nucleus of the forebrain known as the striatum, as well as atypical striatal inputs into the basal ganglia (a neuronal network that plays a role in motor function and is thus relevant to PD and other neurological disorders manifesting with tremors and other involuntary movements). However, current research has been focused largely on extrastriatal mechanisms rather than striatal discharges in PD. Recently, however, scientists at Emory University School of Medicine, Atlanta, San Pablo University, Madrid and Instituto de Salud Carlos III, Madrid studied striatal projection neuron (SPN) patterns in PD patients undergoing deep brain stimulation (DBS) surgery, and compared that activity pattern with patients having the non-PD conditions essential tremor (ET) and isolated dystonia (ID) that lead to tremors and intermittent muscle contractions, respectively. The researchers found that their study provides significant insight into the role of striatal mechanisms in basal ganglia circuits and PD pathophysiology, as well as reports for the first time altered striatal SPN activity in dystonia and activity compatible with unchanged striatal function in ET. Prof. Stella M. Papa and Medical Xpress discussed the paper that she and her co-authors published in Proceedings of the National Academy of Sciences. Describing the challenge of comparing striatal recordings across Parkinson's disease patients, isolated dystonia and essential tremor patients, and correlative findings in nonhuman primates, Papa tells Medical Xpress that the problem of human studies conducted in patients is the lack of normal controls for invasive procedures. "That's the reason why we needed to obtain recordings in patients with other disorders and make comparisons with Parkinson's disease." Papa adds that by including non-human primates, the researchers were able to establish an all-important reference for – and then examine possible parallels with corresponding human data – the characteristics of normal and pathological striatal neuron activity. "We had the resources at the Yerkes National Primate Research Center to record neural activity in monkeys using a model of advanced Parkinson's disease and normal animals for comparison," she explains. 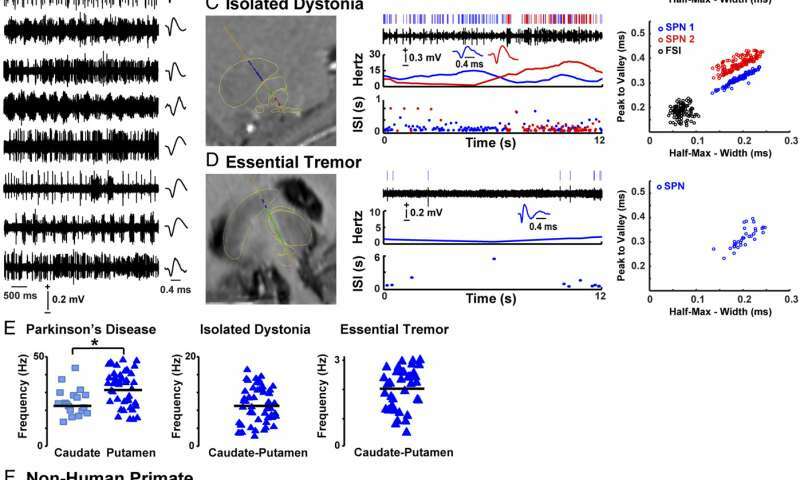 "On the other hand, the study design also provided important information about the striatal activity in Isolated Dystonia that is definitely altered, and in Essential Tremor that is very similar, compared to normal primate neural activity." Papa notes that the study also faced significant challenges related to the human striatal recordings during deep brain stimulation surgery. "Striatal neuron recording is particularly difficult and requires more time to reach stable neuronal firing, but available time in surgery is very limited." Another factor, she continues, is that recordings in Isolated Dystonia presented the additional challenge of finding surgical cases without anesthesia, since many dystonia patients are currently operated under anesthesia, which can have a large impact on neuronal activity." The study also addresses the observation that convergent cortical, nigral, thalamic, and various interneuronal signals could variably exacerbate or compensate for the lack of dopamine modulation on striatal projection neurons discharges. "The microcircuit controlling the activity of striatal projection neurons includes multiple signaling mechanisms that derive from cortical, nigral and thalamic terminals, and various types of interneurons" Papa explains. "After dopamine modulation is lost in Parkinson's disease, the other signaling systems may undergo secondary changes that further alter the function of striatal projection neurons." She cites the example of glutamate system involvement in corticostriatal and thalamostriatal connections, which is known to be overactive in Parkinson's disease – but adds that defining the abnormal activity of striatal neurons that project into the basal ganglia network is the first step. Papa tells Medical Xpress that in the past in vivo recordings of striatal projection neuron (SPN) activity have been elusive due to the inherent difficulties in obtaining data from these neurons, this being due to instability and low-firing in the normal state, or to the availability of chronic dopamine deficiency animal models for recordings without anesthesia. "Surgery for deep brain stimulation offered us the unique opportunity to determine the firing status of striatal projection neurons in patients with Parkinson's disease. This data is critical to continue with the investigation of pathophysiology in animal models reproducing human findings. As it turns out, however, SPN activity in the primate model of advanced parkinsonism is practically the same as that found in human patients." The paper discusses several important results, such as direct evidence that the striatum contributes significantly altered signals to the network in Parkinson's disease patients. "Dopamine neurons of the substantia nigra pars compacta (SNC)" – a region which regulates the striatum, thereby playing a role in movement – "giving rise to the nigrostriatal pathway degenerate in Parkinson's disease," Papa says. "The resulting loss of striatal dopamine is a major pathological change in basal ganglia, and therefore, striatal mechanisms are thought to play a significant role in motor dysfunction." However, she stresses that direct evidence for abnormal striatal outputs to the basal ganglia network in PD was lacking because the available imaging studies in patients did not provide conclusive findings, and there was no electrophysiology data in patients. "The present study finally provides direct, documented evidence that projection neuron activity has significant abnormalities in Parkinson's disease." Relatedly, the researchers observed spontaneous striatal projection neurons activity in advanced Parkinson's disease. "Findings across patients with different motor disorders – and comparative primate data – allowed us to characterize SPN activity in PD." To examine spontaneous, stationary firing and avoid confounding activity changes related to the specific actions, SPNs were recorded in alert patients in resting conditions – so the same type of activity was compared across groups of primates and patients during surgeries without anesthesia and with electrode trajectories passing through striatal areas. "After extensive processing of data for classification of neuronal activity," Papa notes, "a total of 155 neurons from recordings in patients were finally analyzed to characterize the activity of striatal projection neurons." Recordings in patients with essential tremor showed very low activity of the striatal projection neuron that matched findings in the normal primate, indicating lack of neuronal firing abnormalities in this disorder. "These results were in agreement with the absence of reported striatal pathology or dysfunction in this disorder," Papa points out, "which is associated with oscillatory activity in the cerebello-thalamo-cortical circuit" – a circuit that involves the cerebellum, which coordinates and regulates voluntary and involuntary movement, balance and possibly cognitive function. "In addition, the lack of abnormalities in essential tremor patients provided an important point of reference for interpreting the data from other patient groups." The scientists also found that patients with isolated dystonia showed abnormalities in the firing of striatal projection neurons that were less pronounced than in Parkinson's disease. "These novel findings in dystonia contributed information about the role of the striatum that has been associated with the pathophysiology of this disorder," Papa explains. "Moreover, data of patients with dystonia provided a positive control for Parkinson's disease as a different entity with known striatal mechanisms." The comparison with PD thereby demonstrated distinctive changes in the activity of striatal projection neurons in this disease. "Overall," Papa concludes, "the complete analysis – including comparisons with non-human data – revealed significant firing alterations of the striatal projection neuron in patients with Parkinson's disease. These neurons fired at much higher rates and with frequent bursts of activity, and this activity compared to the very low and isolated firing found in Essential Tremor or the normal primate demonstrated profound dysfunction in PD. Papa states that this data has major pathophysiological implications. "On the one hand, results proved the high impact of dopamine loss in the striatum that is uncompensated and possibly further altered by internal microcircuit mechanisms, and thus, the striatum likely plays a key role in network abnormalities. On the other, the large SPN activity changes point to dysregulation in other signaling systems – particularly the glutamate that drives the activity of SPNs – and likely contributes to such an increased firing in PD." Moving forward, Papa says that the scientists will continue their research into the identification of primate model SPN subpopulations to determine the changes in particular striatal outputs, as well as to probe different mechanisms to identify the leading causes of the observed SPN firing changes beyond the loss of dopamine modulation. "The application of new optogenetic tools may facilitate the identification of primate neurons – and we expect to couple this technology with the pharmacological and pharmacogenetic manipulation of signaling in each subpopulation. A better understanding of the generation of these abnormalities may help researchers find new targets for drug development or advancing other innovative therapies. The ultimate goal of these studies is to improve the treatment of patients with Parkinson's disease."